Categories: Franchise TM, Investment in Your Health, Registered Dieticians, Virtual TM, Weight Loss Program | Tags: Beth Thompson, Beth Thompson TM, fat loss, franchise opportunities, weight loss program for men, weight loss program for women, weight management | Permalink. Studies you may have recently seen in the news are now announcing what Target Metabolism has been saying for years… Weight loss depends on Calories In verses Calories Out….period! 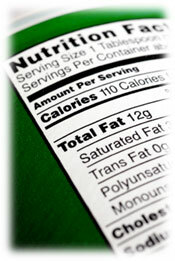 In the 1990’s, Americans were encouraged to cut out most fats in a fat-free diet. As a result, manufacturers added a lot of sugar (carbohydrates) to food to make it taste good. We believed as long as we ate “fat free”, we could have as much of it as we wanted! As a result, the obesity rate in America sky-rocketed. In this decade, Americans have been encouraged to cut out carbohydrates. The fad-pendulum has swung to the opposite end of the spectrum. So now instead of making fat-free foods, the same manufacturers are making “carbohydrate free foods”! And guess what? We’re buying them! Those manufacturers have capitalized on our willingness to try to “trick” our body into weight loss for TWO decades. Our results prove this… weight management is a factor of “calories in” verses “calories out”…period. You cannot trick your body into losing weight forever. You cannot starve your body of a specific nutrient forever. You must feed it ALL the necessary nutrients, INCLUDING fats and carbohydrates… but your total caloric intake must counter your total caloric output according to your weight management goals! Your Team at Target Metabolism is ready to help you lose weight with FDA-approved technology, a Registered Dietitian, massage therapy, and continuous support. We would love to meet you! Categories: Franchise TM, Investment in Your Health, Registered Dieticians, Virtual TM, Weight Loss Program | Tags: Beth Thompson, Beth Thompson TM, diet, diets that work, target metabolism, weight loss plans, weight loss program for men, weight loss program for women, weight loss programs, weight management | Permalink.